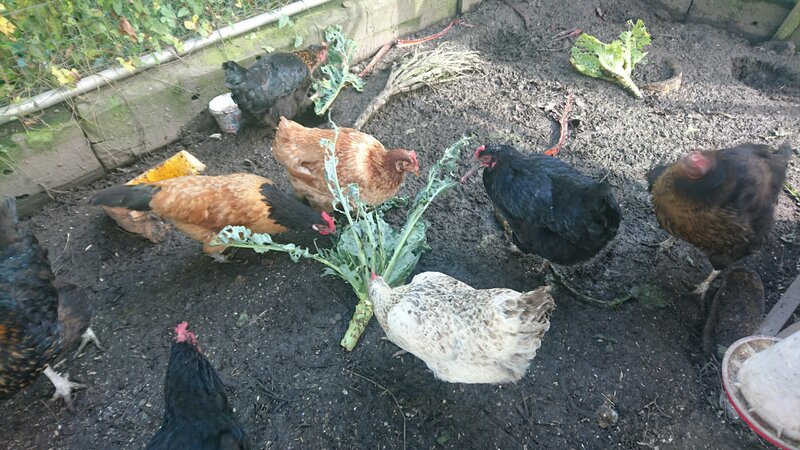 It’s been a manic few weeks at my new job and visits to the allotment have mainly consisted of running down to feed the chickens, clean them out and not much else. 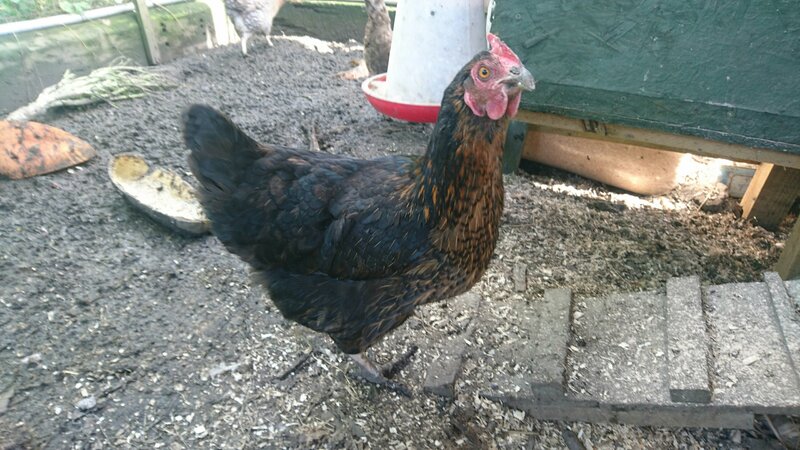 Today I went down to do a partial clean out of the coop and to turn over the soil in the coop. It’s been months since I last turned the soil and it’s a job I always try to put off for as long as possible. It’s mainly the smell of the top layer of the soil that makes it a nasty job. 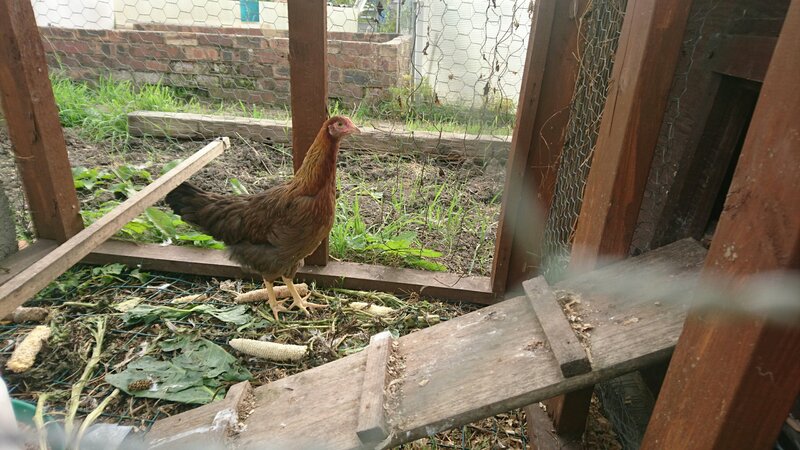 Fortunately with a smaller coop it only took half an hour – it would have been quicker if there hadn’t have been a chicken free for all over the numerous worms I was turning up. I nearly decapitated Fizz when she made a desperate dash for a worm and had her head between the prongs of the fork! Stupid bird! The clean out of the perches in the nest box every two weeks has definitely kept us on top of the dreaded mites. In the next couple of weeks we will be doing a full nest box clean out which should get the last few survivors. Millie continues to grow at a rate of knots and it’s looking absolutely stunning! Sophie’s Garden is finally having some work done on it. Apparently there are big rifts between the committee and the rest of us on site about what it should contain and who should be doing it. Andrea has refused to do it due to the committee being totally indecisive. Cliff, Mick the Mouth and Geoff along with Darren are going fully gung-ho, determined to finish the hard landscaping shortly after bonfire night. Watch this space! Having spoken to Andrea about her growing tunnel I have decided to nab some more of her ideas. The greenhouse frame which Fiona and I dismantled and brought back to the site has lost all its glass. It will cost a fortune to replace all the glass for a 12ft by 10ft greenhouse and no one will buy just the frame. 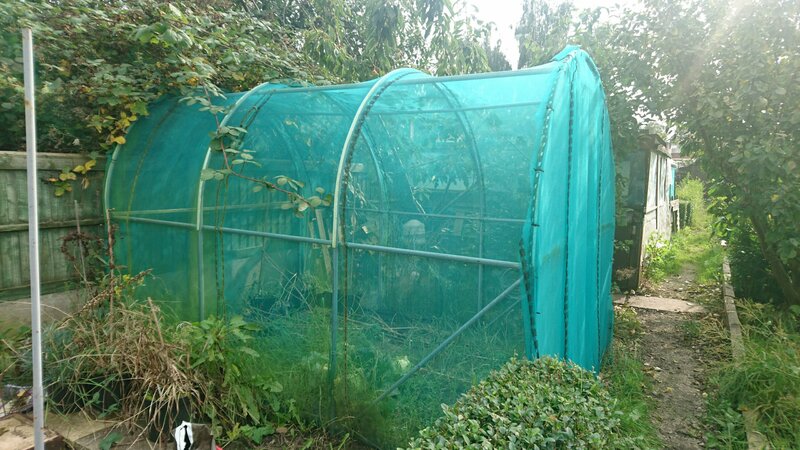 So, I plan to put it up and buy some cheap but strong netting and turn it into a fruit cage. It should be big enough to house all our new fruit bushes and possibly a couple of other plants. I won’t be able to build it by myself so it will have to wait for my long suffering hubby to have a weekend off from work. 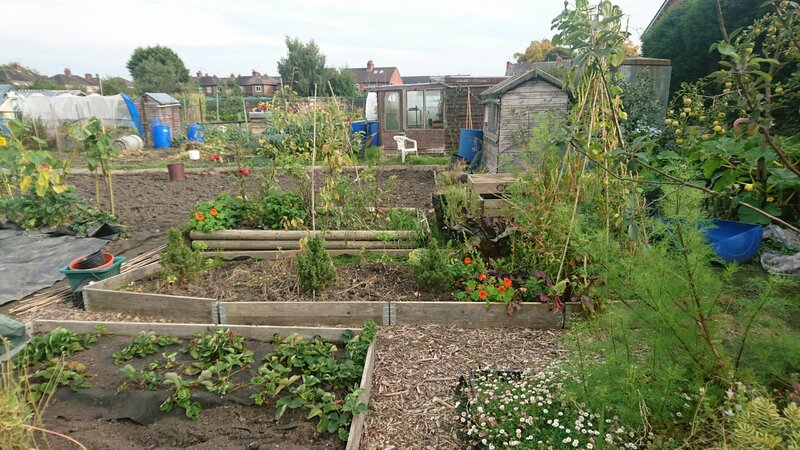 ￼I have decided that the long stretch of ground between the shed and the fruit trees needs breaking up as I am sick of death of constantly weeding with little visible improvement. 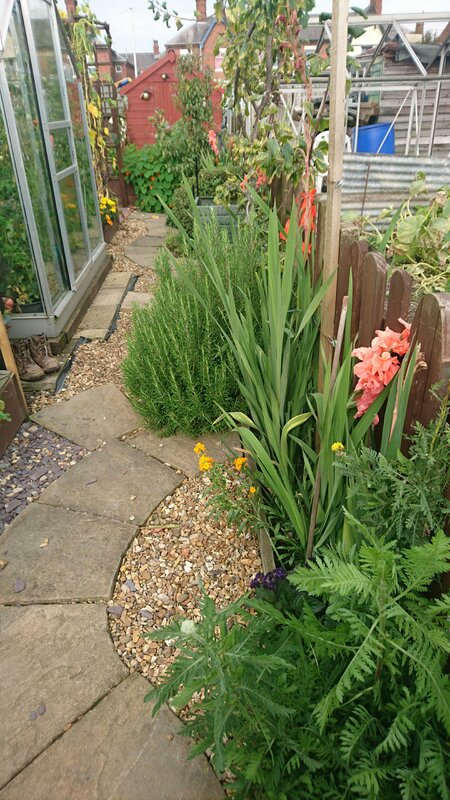 On the rare occasions I have managed to weed the entire thing, it lasts less than a week before its overgrown again! 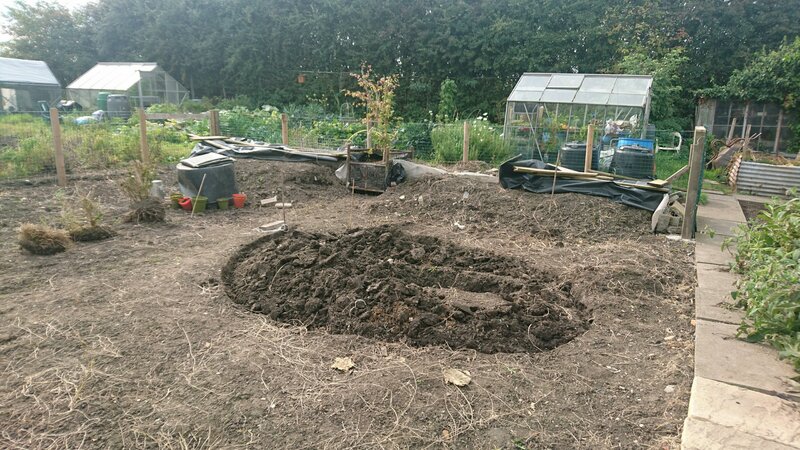 Thus, in the next few weeks I am going to do some building works to block off some areas and put in some paths to change the look and feel of the plot. Plans to follow in future posts!